Passing the Sculpture Pond on King Street today (see May 1 and July 18), I saw a gray object about a foot wide and eight inches tall protruding from the scum a few feet north of the island. I had never noticed it before. Instead of walking down to the shore for a better look (I was in a hurry to get home for a conference call), I cranked my telephoto lens to 40x and shot this picture. I didn't realize what I had captured until I opened the picture in Photoshop an hour later. The object looks like the head of a crocodile, or perhaps some near relative, facing in my direction. The problem is, I don't think any aquatic reptiles of that size live in Connecticut. In addition, the creature's symmetry and patterning seem almost too regular to be real. Also, what is that object protruding from the animal's head? 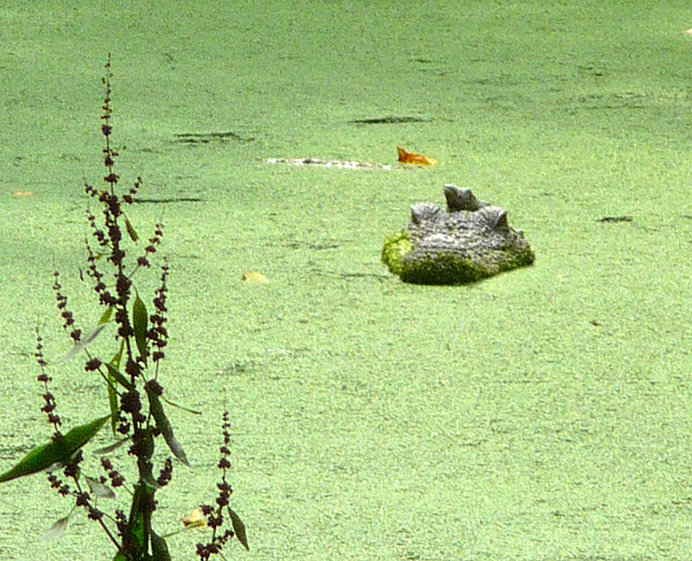 I wonder if the pond owner has installed a concrete replica of a crocodile, as a joke. I'll take a closer look tomorrow. .